For business attire or business suits, the color is straight forward. The standard color for suits are navy or grey. The choice is limited but it STILL needs to be done right. There is no other color that looks smarter or flatter one’s skin better than these two colors. Black is too boring, brown isn’t for everyone and light tan or grey is on the casual side. The color needs to be dark for business and again not that dark that looks like almost black. Navy is the gold standard for business suit. Sometimes men end up buying too dark navy, that is midnight navy blue. Which looks close to black. Midnigh navy looks pale and pasty. On the other hand, mid blue have become very popular over the years, particularly at weddings. Mid blues would be too strong color for most offices. In general, the paler and brighter a colour the more casual it is, so if you want to wear a colour like this, have it in something more casual, like a linen jacket. Navy is serious, professional and yet interesting enough in terms of colour combinations. Midnight blue looks smart with a white shirt and black shoes, but that’s about it. Navy, on the other hand, also looks good with those accessories, but brings out chocolate-brown shoes as well. And a blue shirt under a navy suit provides a great background for experimentation with colour in the tie or handkerchief – strong colours against black just look cheap. Most of this applies to greys as well. Sometimes men wear grey that is way too dark and looks almost like black and with little texture. Generally, there are really two good categories of grey that can be worn for business: charcoal and mid-grey. Charcoal is a sober and professional, and works particularly well in flannel, but (like navy) it cannot be mistaken for black. Mid-grey, however, is kindest of all the suit colours on skin tones – it compliments a good tan, but it doesn’t wash out the pasty. 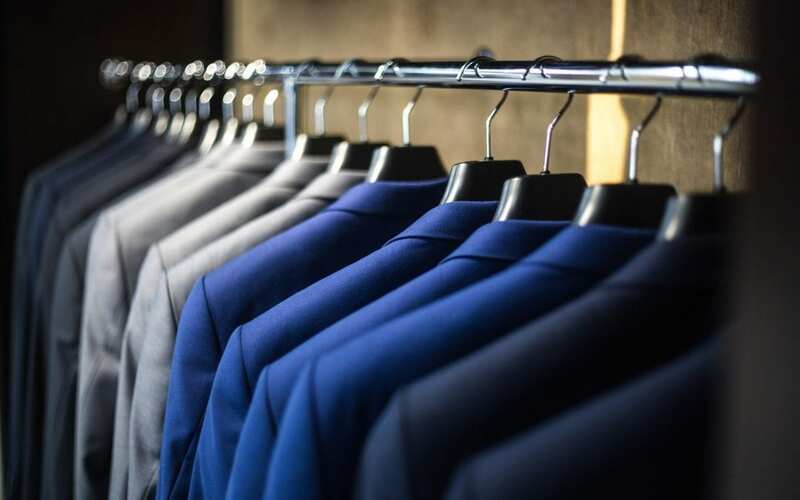 It is for that reason that I would recommend creating a business wardrobe (or commissioning their your bespoke suits) in navy, charcoal and mid-grey. Mid-grey might feel a little adventurous. It is a touch lighter than the grey suit you would instinctively buy for business. 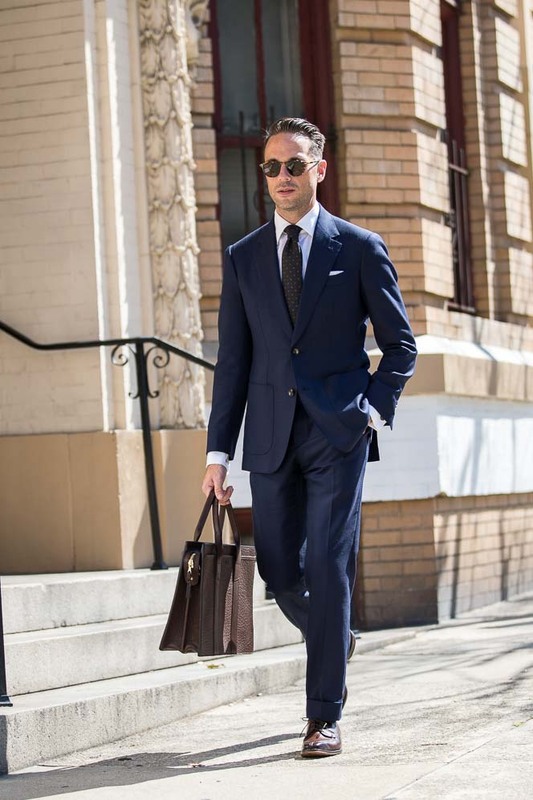 Don’t be afraid – it will look perfectly serious with a blue shirt, dark tie and deep-brown Oxfords. But it will also work wonderfully in a casual summer setting, with a white shirt, mid-brown shoes and perhaps a white linen handkerchief. Should I pick a pattern? 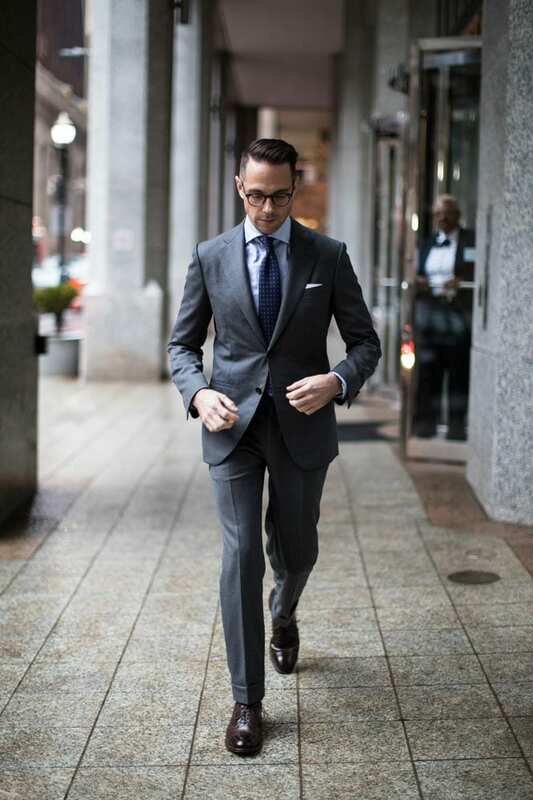 If you are getting your first bespoke suit, make it plain. There is enough aspect of the suit to be worried about like; fit, style, color, customization. When we say plain, it means twill weave. That is a very fine diagonal line running across the fabric. Worst wool (the material that most suits are made of) is rarely plain. There are twills, pinheads, pick on pick which come across as plain but its not. In general, minor patterns is a good thing. Its gives character to the suit. Unless the desired look is upmost formal, a little pattern or texture adds to the interest of the suit and contrast nicely with tie and shirt. So consider those little patterns to be nothing more than texture. Herringbone is often a good option for a second or third suit; essentially a broken twill, it adds a touch of interest without sacrificing seriousness.